Stevie loves sharks. A LOT. Each time his mom asks him to do something, such as brush his teeth, Stevie responds with a cheeky shark fact, like: “Mako sharks don’t have to brush their teeth because they’re covered in fluoride.” From morning to bedtime, Stevie and his mom’s witty banter escalates. Will they learn to listen to—and maybe even understand—each other? The toothy tyke of Bob Shea’s Dinosaurs vs. Bedtime has a new cousin. Shark fans will be delighted. 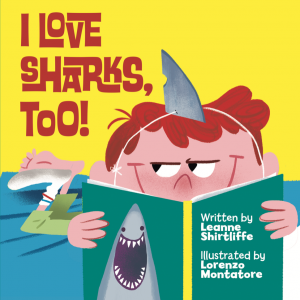 The ultimate book for all young ichthyologists…A must-have for shark lovers.